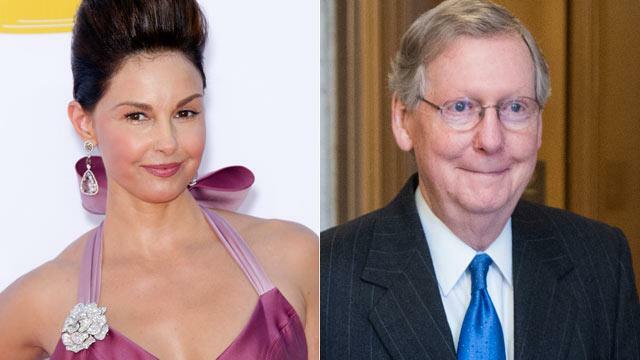 Actress Ashley Judd is "seriously considering" running for Senate, according to Kentucky Gov. Steve Beshear. Beshear, a Democrat, spoke with Judd on the phone last week about her potential Senate bid which would pit her again Republican rival and Senate Minority Leader Mitch McConnell. "I talked to her again the other day, she called me and we had a good conversation," Beshear said at a press conference with local reporters on Tuesday. Though the governor did not go into specifics about their chat, he did say that Judd is "seriously considering a race for the United States Senate and the Democratic primary." Beshear told local reporters that the actress would be an "effective and formidable opponent" against McConnell in a general election. Beshear is not the only Kentuckian convinced that Judd might take a stab at politics. Democratic Rep. John Yarmuth, a big supporter of Judd, told ABC News, "I would be surprised if she doesn't run at this point." "My impression is this is something she wants to do, and she is now taking the time to make the contacts she needs to make throughout the state to try and generate commitments of support and in some cases fundraising," Yarmuth said. "She is certainly acting like a candidate, a potential candidate. Though Judd has neither confirmed nor denied a run in the 2014 Senate cycle, the actress has already received criticism from Republican opponents. Just last month, she was subject of an attack video posted online by a conservative super PAC, American Crossroads who called her an "Obama-following, radical Hollywood liberal." The Hollywood starlet has captured the attention of young Kentuckians but it seems as if now Senator McConnell is trying to do the same. Today, McConnell's campaign team released a "Harlem Shake" video on YouTube. Though McConnell does not appear in the video himself, a giant McConnell head is dancing aside a slew of patriotically dressed Harlem Shakers at Churchill Downs, the thoroughbred racetrack known as the Home of the Kentucky Derby.